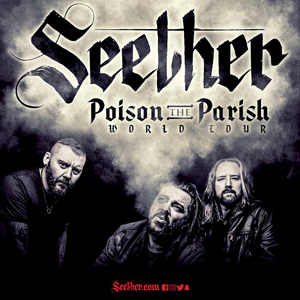 “Betray And Degrade”, SEETHER’s newest music video from their seventh full-length studio album Poison The Parish, premiered today. This is the second music video the band released from their latest album. Watch “Betray And Degrade” now on KNAC.COM HERE. Poison The Parish (Canine Riot/Fantasy), which hit on May 12th, 2017, debuted at #1 on Billboard's Hard Rock albums chart, #14 on Billboard's Top 200 albums chart, and #8 on Billboard's Current albums chart selling more than 31,000 copies in its first week. Most recently the band shared lead single “Let You Down”, which sat at #1 across the U.S. at rock radio for four consecutive weeks. Poison The Parish, recorded at Blackbird Studio in Nashville, Tennessee, marks the first album produced entirely by front man Shaun Morgan. Perhaps the heaviest and most expressive collection they've ever released, the album is earning their best notices in years.